Sort the beans carefully, discarding any misshapen or discolored beans. Check carefully for small stones. Place beans in a colander & rinse thoroughly to remove all dust. 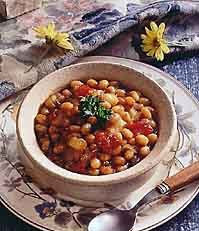 Then place the beans in a large pot or bowl. Add cold water to cover by several inches. Soak the beans about 14 hours The beans should be smooth & doubled in size. Drain the beans in a colander. Rinse well with cold water. Discard any beans that haven’t re-hydrated. Place the beans in a stock pot. Add enough cold water to cover the beans by about ½ inch. Bring to a boil & boil vigorously for 10 minutes. Continue to boil the beans for another 5 to 10 minute until the skin moves on the beans when blown on or you can slip the skin from the bean by pinching a bean between your thumb & forefinger. Drain & rinse the beans reserving the cooking liquid. Cut the salt pork in half, if the salt pork is thick, cut horizontally. Score the rind. Cut half of the salt pork—the rindless section if halved horizontally—into 3 or 4 pieces and place them in the bottom of the bean pot. Add the beans to the bean pot. Mix together the sugar, molasses, mustard, salt & pepper. Scoop onto the top of the beans but do not stir. Add enough of the reserved bean-cooking liquid to barely cover the beans. If the water is not penetrating the beans, insert a table knife & gently push the beans apart allowing the water to penetrate. Place the remaining half of the salt pork, rind side up, on top of the bean mixture. Cover the bean pot. Bake for 5-6 hours Check the beans periodically for liquid—about once every 1 ½ hrs or so. Adding additional reserved liquid as necessary—the liquid should be boiling when added. It’s done when they become dark & tender. The beans should not be mushy. Allow the beans to stand for 30 minute before serving.